Since 2011, recording artist Maureen Davis has danced 101 days in a row for a number of special causes: cancer, arthritis, and her own mother’s health. Trained in Lindy Hop and Salsa, she danced three songs per day minimum (which usually turned into three hours) with a social dance partner in a public place and reported her progress on Facebook. Now, newly signed to Swingtone Records with distribution on InGrooves/Universal Music, the lead singer of Jump Swing Rockabilly band Maureen & the Mercury 5 (M&M5) has two weeks left in a 60-day campaign to raise money to finish her new album. Davis is staging a new dance-a-thon, ‘Rock A Mile in Our Shoes’ at Fred Astaire Dance Studio in Pasadena, dancing 25 hours for $25 ($1/hour). Partial proceeds will benefit The Actor’s Fund of America (AFA), a nationwide human services organization that helps all professionals in performing arts and entertainment – one that even helped Maureen last year. “There is no way I would be dancing and singing without the help of The Actor’s Fund,” says Davis, who received pre-Obamacare assistance for medical care and vocal cord rehabilitation due to walking pneumonia. AFA’s Dance Resource has even bought Davis and other performers dance shoes. Davis’ dance antics – complete with hourly Instagram/Twitter/Facebook reports — commence Friday, November 7th at 7:45pm and ends Saturday, November 8th at 8:45pm. Lindy Hoppers and Blues dancers from dancehalls including Pasadena Ballroom Association and Joe’s Great American Bar as well as the general public are welcome to enjoy special entertainment and DJ’d music. Fred Astaire Studio owner and dance teacher, Danielle Deborah, has donated her venue for the ambitious event and will offer a kickoff social dance Friday night and classes throughout Saturday. Donations may be made by VISA/MC www.pledgemusic.com/projects/mm5, earning contributors signed CDs, mailed to their homes, postage paid. Pay-what-you-can cash donations will also be accepted as well. Davis, who boasts two songs in the Oscar-winning Clooney film ‘The Descendants’, 200 songs on TV, a world-tour and Carnegie Hall performance and two years on Broadway in the original cast of ‘Into The Woods’ (with Bernadette Peters) is hot on the heels of Imelda May and Brian Setzer, bringing rockabilly and swing music back to the mainstream. Her USO-singer mother’s career was cut short by bad marriages and challenges of women in the 60’s and 70’s. Record Producer/Swingtone Label Head Tony Valenziano and Sky Rocket Entertainment Marketing Director Kevin Day — who have run successful comeback crowd-funding and promotions for The Babys, Rick Springfield, Ted Neeley and Rickie Lee Jones — designed M&M 5’s Pledge Music campaign to draw in new fans while raising much-needed funding for post-production art, marketing, publicity and radio promotion prior to the record release. M&M 5 currently appears on the site with Weezer, Ingrid Michaelson, Smashing Pumpkins, Korn, giving fans a way to share in the creative process, buy custom band logo collectibles and pre-purchase music before it hits record stores or iTunes. 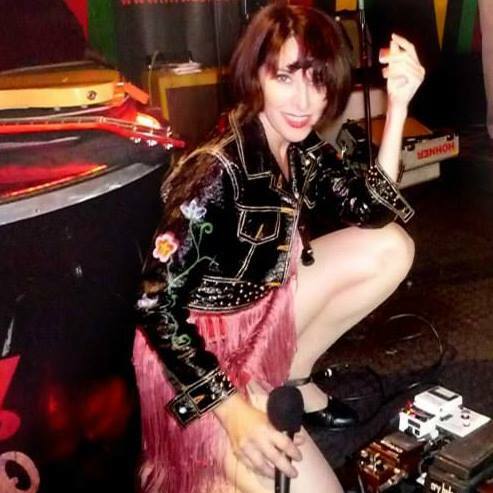 M&M5’s sound is notably inspired by Bo Diddley & Chuck Berry, influenced by inimitable soubrettes Dusty Springfield, Ann Margret and even Chrissy Hynde. A smash at Viva Las Vegas (VLV) 2013, M&M 5 was among the top 20 bands featured on the VLV compilation CD and entertains thousands as resident artists at Disneyland and at the historical Queen Mary in Long Beach.